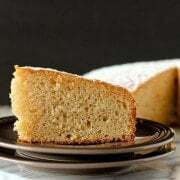 This yogurt cake has so much great flavor thanks to clementines and vanilla beans that you won’t even notice that it uses whole wheat flour and yogurt! This time of year, we go through clementines like craaaaaazy. E loves them, Ben loves them, and I love them. Easy to peel, easier to eat. But sometimes I go a little overboard when I’m buying them at the store and I need to find another use for them. Plus it is fun to play around with different uses for something other than just peeling and eating. 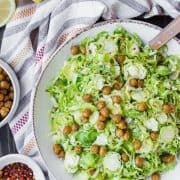 When I saw this recipe on Girl Versus Dough, I knew right away that I’d be making a take on it. I loved that it included whole wheat flour and yogurt. And obviously, the star of the show, clementines. I of course added some vanilla beans because I just can’t help myself! I add them to everything: cream cheese, butter, frosting, granola, applesauce, candied walnuts, etc. Plus I adore the sweetness that vanilla adds to citrus. As demonstrated by my love of all things orange creamsicle but that’s a whole ‘nother addiction to talk about on a different day. This cake is really simple to make and can be made with all pantry staples. Assuming your pantry is stocked exactly like mine. It is, right? Fridge staples too — I always have plain Greek yogurt on hand. Even for the kids. I prefer it to the flavored kinds — less sugar! I just add a little brown sugar, some vanilla extract and a sprinkle of cinnamon. They both devour it. 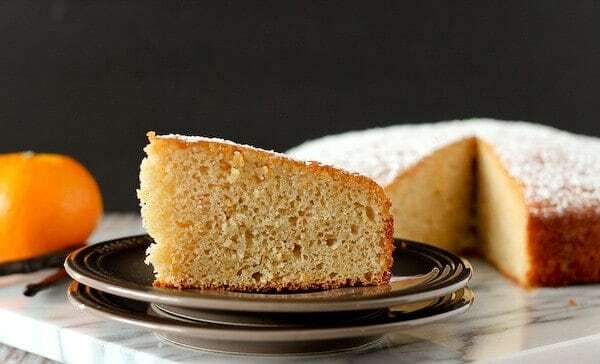 The best part of this cake (besides the vanilla beans) is the syrup that you create to pour over the top. 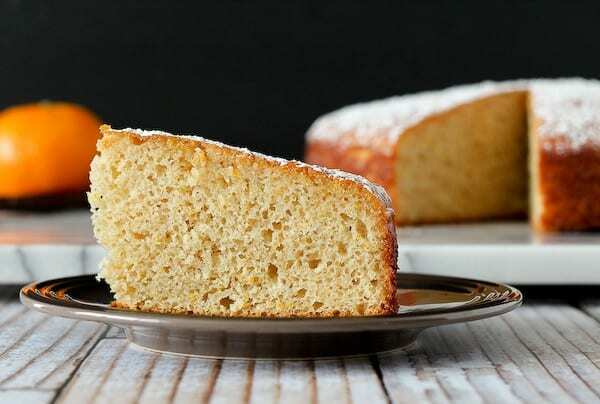 It creates this moist, sticky, sweet layer on the top of the cake. Something for the powdered sugar to stick to, you know? Heat oven to 350 degrees Fahrenheit. Grease bottom and sides of a 8-inch round cake pan with nonstick cooking spray; line bottom with parchment paper and then spray parchment paper with nonstick cooking spray as well. . In a large bowl, whisk together all-purpose flour, whole wheat flour, baking powder and salt until combined. In another bowl, whisk together yogurt, 1 cup of the sugar, eggs, clementine zest, vanilla extract and the caviar from inside the vanilla bean (save the scraped out pod!). Put vanilla bean pod in a small bowl and cover with remaining 1/3 cup of sugar. Set aside. Slowly stir wet ingredients into dry ingredients until combined. Do not overmix. Stir in oil. Pour batter into prepared pan. Bake 40 to 50 minutes until a toothpick or knife inserted in the center comes out clean. Cool about 10 minutes in pan, then remove from cake pan and transfer to a cooling rack with a rimmed baking sheet underneath it. While the cake is cooking, heat a small saucepan over medium heat and cook the clementine juice, sugar/vanilla bean pod mixture, stirring until sugar is dissolved. Let vanilla bean pod stay in this mixture until the cake is on the cooling rack. Then remove the vanilla bean pod and pour the juice/sugar mixture evenly over warm cake on cooling rack. Cool completely. If desired, sprinkle top with powdered sugar before serving. Verdict: Writing this post is making me want to stop writing this post, get back in the kitchen and make the cake again. I loved it. Husband’s take: He said it was a “little too much” with the clementine flavor but he ate about 3 slices. I’ll let you come to your own conclusions. My parents got to sample this cake and they loved it! Changes I would make: I might poke some small holes in the cake next time so the syrup can really saturate the cake (a lot ran off) — it isn’t really necessary but you can’t go wrong adding more of the stuff to the cake. You can baste on the sauce. Thanks for the recipe! No harm in trying! I bet it would be great! Just baked this with my daughter who usually loves to cook and tastes everything while we bake but does not eat much once done. Well, she ate almost half of the cake!!! I love that it is a healthier cake but that it is still delicious! I did not have greek yoghurt around so I used ‘fromage blanc’ (I’m in France) which is pretty close in taste and thickness (it is not cheese!). It was perfect. I prepped both sugars the night before so the zest and vanilla would infuse. Love this cake! I wouldn’t change a thing! This looks completely and utterly perfect. Love it!! I love cakes with yoghurt in them and this one sounds great. Gorgeous cake and I LOVE these flavors!!! 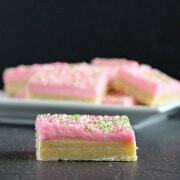 I bet it would be awesome with a touch of cardamom too! Orange creamsicle cake…drool. Pinned and shared! oh man, I loooove a good citrus cake! This sounds so fantastic! WE go through clementines like crazy around here too..my son will eat like 5 of them in a sitting! 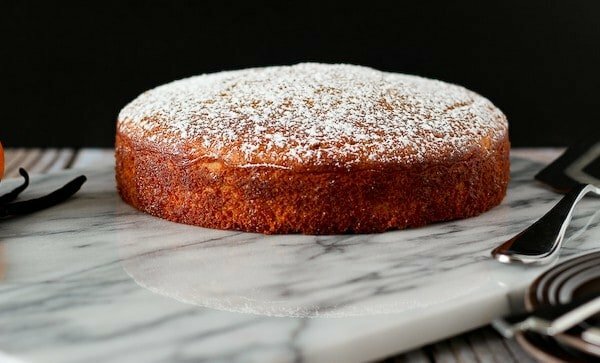 What a handsome cake – look at that crumb! I’m a fan of vanilla with citrus, too. Can’t wait to make this guy! Thanks for sharing. I absolutely adore oranges this time of year- and this cake is so gorgeously fluffy! Homerun, love! 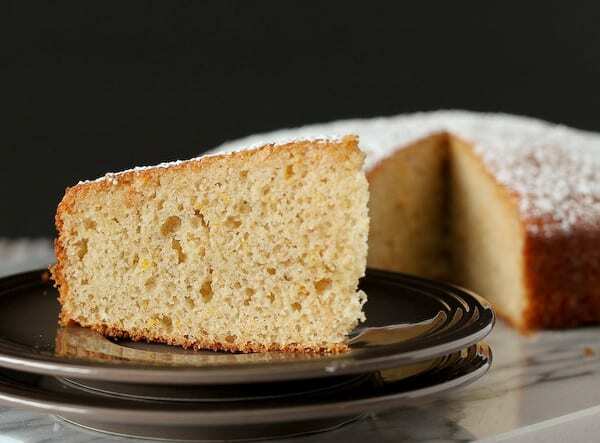 I love citrus in a cake…and I love baking with clementines. Looks great! Oh my this cake sounds delish! I love the flavors! I need a piece of this yummy cake! What great flavors for a cake! Love the simplicity of it! Holy delicious! This cake looks awesome! You’re making me want to go for a round two with olive oil. :) Tonight. haha! Oh I LOVE this! I just ordered a big ol’ bag of vanilla beans and am looking for yummy ways to use them. 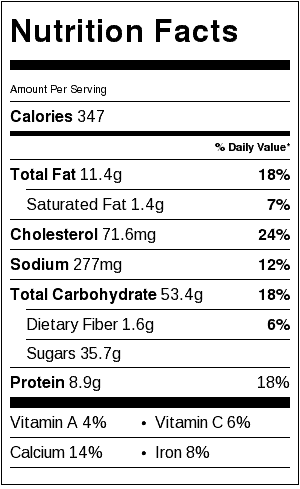 I’m in :) Random question–is the orange flavor super strong? 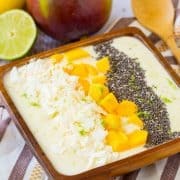 My silly husband isn’t a fan of strong citrus flavors (we are in couples counseling to address this issue), so I’m wondering if I can/should adjust. OH man — it is pretty predominate. Maybe decrease the amount of zest a little? Oh, what a fantastic, amazing sounding cake! I bet the combo of the clementine flavor with the vanilla beans is just divine. This is exactly what I love to eat with my afternoon tea as a little naptime treat for mama. =) Perfection! Wish I had a slice now! What a simply beautiful cake! Such a pretty cake. Healthy and utilizing seasonal clementines :) Pinned! Thanks for the pin, Liz! I love the simplicity of this cake. The flavors have a time and place to shine! So beautiful too :) I must make it!! Thanks Zainab! Hope you love it! 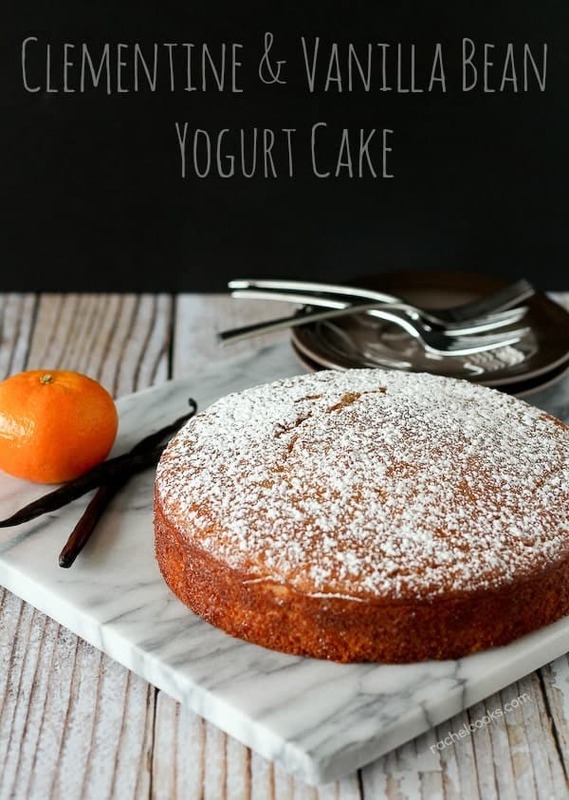 This cake is SO gorgeous and I love that it uses whole wheat flour and clementines! Yum! I’ve been eyeing up that cake too! I love how bright and fresh it is yet contains all the goodness of wholewheat flour and greek yogurt. Yes! Make it! It is so good! Cake with whole wheat flour and yogurt?! That means I can have 2 slices, right? ;) Rachel this looks incredible…we love clementines in my family too so this would definitely be a hit!